Finding a top-notch doctor or health care provider is essential to successfully managing your HIV. But it’s also important to find someone you feel comfortable with. How is your relationship with your HIV doctor? Wednesday November 28, 2012 we will have a guest speaker. Jason King from AIDS Healthcare Foundation will speak on AHF’s advocacy programs. AHF is engaged in an effort to curb HIV drug pricing in this country, and our main target right now is Gilead Sciences. As you know, Gilead assigned its newest antiretroviral therapy, Stribild, a wholesale acquisition cost (WAC) of $28,500 per year. This is absolutely unconscionable. Despite calls from AIDS organizations, members of the community, and 13 members of Congress for Gilead to practice restraint when pricing its new drug, Gilead proceeded to price Stribild at a value that exceeds most HIV patients’ annual income. Stribild is a “me too” drug, similar to Atripla and Complera, whose therapeutic benefits are not clinically superior to Atripla—an efficacious single-tablet regimen that costs less. There has even been indication in some studies that the drug may be more harmful to the kidneys and liver than drugs in other regimens. Stribild’s price is going to have a deleterious impact on federal-state AIDS Drug Assistance Programs, Medicaid and Medicare—not to mention private insurers. It is anticipated that Stribild will become a new first-line therapy, prescribed to many. Increased utilization of this drug will further burden already unsustainable and insolvent systems. This will hamper patient access to the drug and cause wait lists to rise. AHF is banding together with fellow advocacy organizations and unaffiliated activists to bring on the pressure. Our goal is to get Gilead to lower Stribild’s price and extend rebates and cost savings to all payers. We have had much success in the past through collaboration with groups like yours in getting big PHARMA to bend to the will of the community. I have provided some supplemental material attached to this email about Stribild (formerly the “Quad”) for your review. I believe companies like Gilead will only change when facing the might of AIDS community solidarity. This Wednesday 11-21-2012 is our Thanksgiving Pot Luck. Bring a favorite dish and come eat and socialize with us the Wednesday before Thanksgiving. This has always been a very special evening, so come join the fun. The topic this Wednesday, November 14, 2012 is Gratitude. You’ll be asked to complete this sentence “I am grateful for……..” which we’ll read anonymously and discuss. The topic this Wednesday is Halloween and Thanksgiving. Thanksgiving is 3 weeks away and we’re going to discuss our annual Thanksgiving Pot Luck scheduled for November 21, 2012. Since it’s Halloween, we’re only going to have a 1 hour meeting 7:00-8:00 pm and then go over to Wilton Drive and enjoy the festivities. So come in your Halloween costume and let’s have some fun. 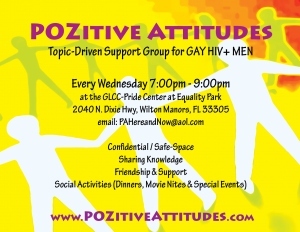 Our guest speaker for the Wednesday night support group, August 8, 2012 will be Dr. Elie Schocket. Dr. Elie Schochet, MD is a male with 5 years of medical experience and practices in Colon & Rectal Surgery and Surgery. He is also the creator and presenter of “The Happy Hiney” which is both informative and funny! Our meeting will be a Question and Answer talk about the things that concern you. So think up your questions.